International Student and Scholar Services (ISSS) is looking for motivated undergraduate and graduate/professional students to be mentors to incoming international students for the Fall 2019-2020 School Year. The Office of International Student and Scholar Services (ISSS) is now accepting applications for Fall 2019 iLEAD Mentors. iLEAD student mentors are current international and US students who volunteer and are selected based on their experience and enthusiasm to build a welcoming environment to Vanderbilt for all incoming international students, even before they arrive at Vanderbilt. We are looking for both graduate and undergraduate (sophomores and up) level students. 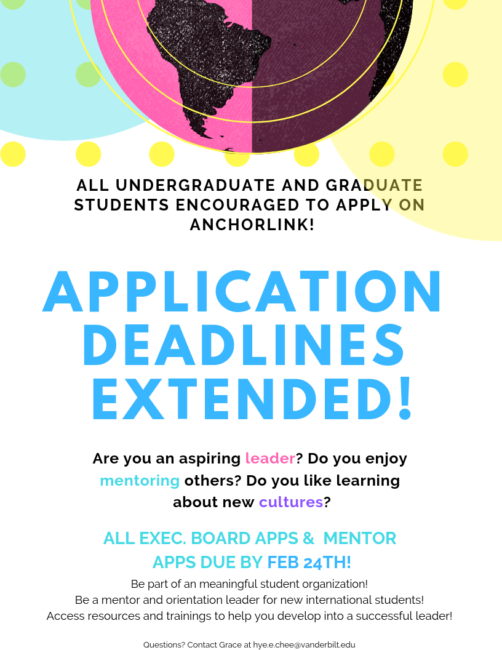 To be eligible, interested students must have been a student at Vanderbilt for at least 1 academic year, must submit the Anchor Link application (along with recommendation) by the deadline, and must complete an in-person interview.